this week's giveaway is sponsored by Murad. i thought this made the best giveaway as Mother's Day is a week away and this would make the perfect gift. after testing the products and looking into the company i have become a supporter of the Murad name. Murad's skincare claims are based on an "Inclusive Health" lifestyle, and i couldn't agree more. health, beauty and wellness issues are not solved by a jagged little pill or a tube of cream. results are seen through topical care, internal care and emotional care. people who take care of themselves in all aspects radiate beauty. the Age Reform Day Regimen includes a Refreshing Cleanser that softens the skin. 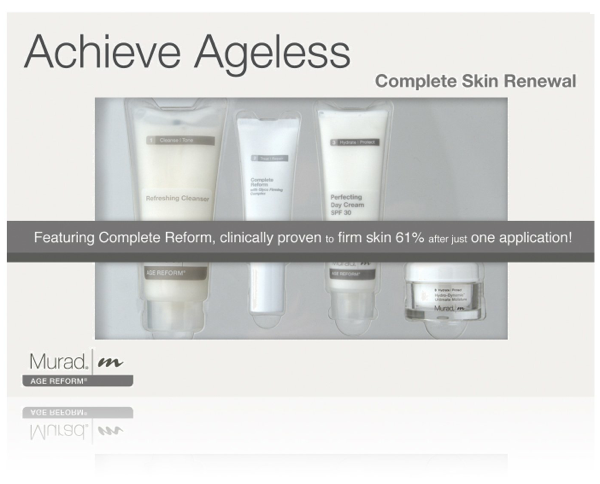 the next step is the Complete Reform treatment cream; a patented formula that increases the firmness of the skin up to 61%! yes, please. following that tiny miracle in a tube is the Perfecting Day Cream with SPF 30 which moisturizers and protects your skin. sounds pretty incredible, huh? you may want to keep this for yourself instead of your mom...just sayin'. if you would like to get your hands on one of these kits "like" me on Facebook. be sure to leave me a comment letting me know you: love me/hate me/like me. I 'like' you on facebook and I love your blog! So glad I came across it recently. I liked your FB, and who doesn't love you! I like you on FB and follow your blog. Thanks! I like you on facebook (Shawna Capot) and I love your blog! I liked you via Facebook @Micaela Staheli! :) And I love your blog and your tutorials! I already like you on facebook and I absolutely love your blog! Liked you on Facebook as Elena Vo! My mom has been asking me for a Murad moisturizer for a few months now-- ironically! She tried one of their facial serums and was very impressed with the results. Her only complaint was the scent, but oh well, things we do for beauty's sake :) Thanks for the generous giveaway and the awesome videos! oh, and I re-tweeted about the giveaway! I liked you on facebook, I love your blog so much! I LIKE Blushing Basics on Facebook! Thumbs up to your blog, too!! I liked you on FB as Olesya Budarkova and also voted for you on Allure.com! Good luck! Liked you on FB, and am liking you too! LIke you on Facebook and like you so much that I also follow you on Twitter! Hi Kristie, How could I not like you? We have the same name!! Liked you on Facebook, too! I liked your facebbook page=THANKS FOR OPPERTUNITY! Interesting Blog. Happy for the opportunity to win as well.